Knotty Cat Tales: A pretty smart pitty! When we decided to move onto our boat, a dog was the last thing we thought would accompany us. I'm sure Wilbur didn't anticipate moving onto a boat either, and so became yet one more poor, exploited pit bull. At least that's what he told anyone who took the time to listen to him. "Oh what the heck!" 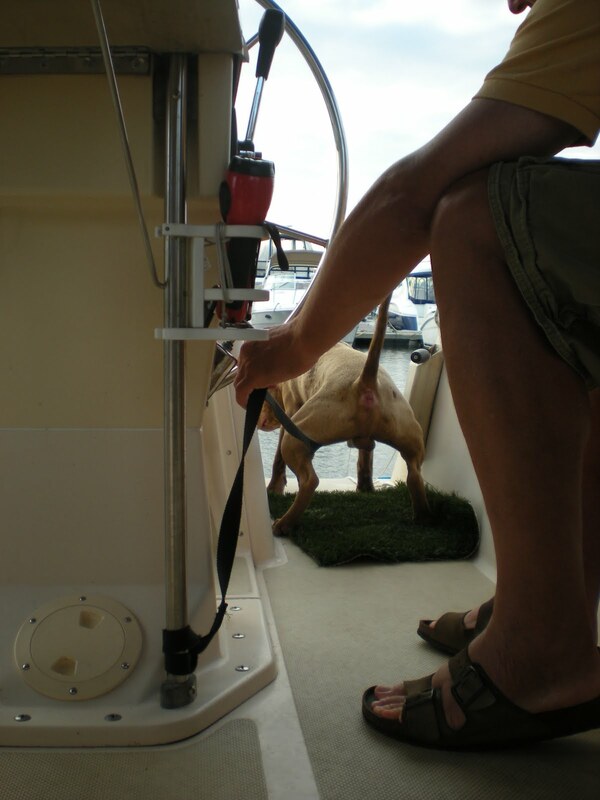 we said, "All you need to train a dog to go potty on a boat is a piece of AstroTurf." So off to Petco I went where I bought a very expensive item called The Potty Patch. PETS LOVE IT!! screamed the print across the front and their proof; plastered on the front of the box, a huge picture of a smug looking little ankle biter going tinkle all over their bright green product. In the stern and right beside the captains seat, our boat afforded the perfect location for The Potty Patch, since if Wilbur ever deigned to use it, his waste could be very easily disposed of by sliding The Patch overboard for a good rinsing. But even though I saturated The Potty Patch with some sort of chemical that was supposed to make dogs want to go potty on it, Wilbur completely ignored The Patch , and we were forced to take him to shore where sometimes he pooped, and sometimes he didn't. Our first week on the boat was trying, to say the least. In addition to nasty weather, dead batteries, and a faulty water pump, Wilbur, instead of pooping on shore, had an attack of explosive diarrhea in his crate. Note: I was very disappointed to find that dragging dirty laundry behind a boat does not get it clean as promised in the many sailing articles I'd read! Finally, well aware that I was suffering from a horrendous case of PMS and hoping to avoid what was sure to be a nasty mutiny, Hans asked if perhaps he should pee on The Potty Patch in hope that Wilbur would catch on. Believe me, he didn't need to ask me twice. Wilbur was riveted with interest as he watched Hans and to our absolute shock proceeded to immediately go piddle on The Potty Patch. And winning an Academy Award can't even begin to compare with the elation we felt the day Wilbur finally pooped on his Potty Patch, an act that took a while longer for him to accomplish since for some reason Hans drew the line at demonstrating that particular bodily function. Tons of cheers and biscuits ensued and then there was no stopping him; Wilbur became a peeing and pooping machine. There were times Wilbur would run to the back of the boat, we'd yank out The Potty Patch, and after barely squeezing out a couple of drops of pee, he'd be in the companionway begging for his biscuit. But the icing on the cake (so to speak) was the day Hans and I 'missed the boat' (pun intended) and Wilbur ended up taking matters into his own paws. I was in the galley whipping up another gourmet delight (hoping the eggs hadn't gone bad and wondering where the hell I'd put the powdered milk) and Hans was busy at the helm studying the chart plotter when I looked up and saw a very poopy Potty Patch lying in a rumpled mess beside the captains seat. That's when we realized that Wilbur, tired of waiting for us, had gone back to the stern and with his teeth, pulled The Potty Patch from where it was hanging, tossed it onto the stern, and used it. It reminded me of a story I once heard about a toddler who would hand its mother a clean diaper in order to get changed! When later on he performed this feat a second time we knew we weren't nuts and that it wasn't just a dream. In the end it only took Wilbur a week to catch on and after talking to other sailors we now realize how lucky we are. One man told us they had to take their dog ashore every morning and night for ten years! 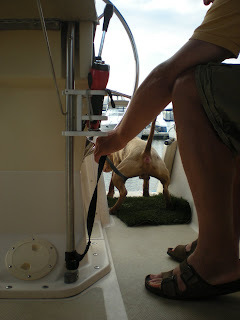 Another said his dog will pee on board but not poop, and we became the envy of the salty dog community! Now that we're back on land we're trying to keep up The Potty Patch practice for our next trip and have installed it on our deck where Wilbur has faithfully kept up with the program. The other night I looked outside to see Wilbur having a massive struggle with The Patch. Using his paws and nose, he was pushing and shoving it toward the edge of the deck where half of it was already over the side. I ran out to stop him and Oh my God, he'd gone poop on The Patch and tired of waiting for me to clean it up, he was trying to dispose of it by tossing it over the side just like he'd watched us do it on the boat! Next week he's taking his PSAT's and we're hoping for a full scholarship to Harvard. Yes, we took a picture! Like I've said before, with no TV, and limited internet access you'd be amazed at what you'll do for entertainment. That is amazing! I knew Wilbur was a smart dog. You should submit this as a "positive thing pitbulls do" on Bad Rap's facebook page. That's a really funny post. I will have to try that, with our dog. We're only sorry we didn't train him to use the toilet! Such a great find and what a "relief" that it worked perfectly. I'll have to get one of those for our little girls before we move aboard. Thanks for the info! I hope it works for you (a piece of AstroTurf would probably be cheaper), and you might even want to start now. Good luck!